Shark cage diving is a phenomenal bucket list experience – offering you the chance to get up close and personal with some of the most respected and fascinating creatures of the deep. The coastal region between Cape Town and Durban is the perfect setting for you to have your shark encounter, and create unforgettable memories, as a solo adventurer or as part of a small group. Why Dive with the Sharks? There are hundreds of animal encounters to experience in the world, and each offers their own indigenous creatures – native to both coastal and land-based environments. However, there is something truly majestic about meeting some of the most famous and infamous shark species in the southern hemisphere – and an unparalleled sense of achievement to be discovered afterwards. Sharks have gotten a bad rap thanks, in part, to Hollywood and the mystery surrounding these elasmobranch fish, of the Selachimorpha clade. While they are certainly built to easily capture and debilitate prey – there is so much more to them than their rows of jagged teeth and small, black eyes. If you have fears – face them. While you might be comfortable with the idea of facing a shark in-person, there is certainly nothing ordinary about securely encountering a shark up close. Facing fear or apprehension can give you a sense of accomplishment and help you see the beauty in one of nature’s most valuable and intricate animals. Through exposure, you might gain renewed respect for these creatures, as they are not small, nor are they weak – but you can also learn more about their importance. Support awareness and conservation. Realistically, Great White sharks are dwindling in numbers. The current population is Gansbaai (Western Cape) is reportedly at less than 350. While the general sentiment towards sharks remains less than ideal, these majestic creatures play an important role in maintaining the aquatic ecosystem. They keep grouper fish from eating herbivores, which eat algae, so that coral isn’t overpowered and fighting for nutrients. The effects of fewer sharks are devastating and can be felt throughout the food chain and oceanic environments. By supporting the industries developed around sharks, you support the need to keep these species thriving in terms of numbers and conservation. Experience something rare. In the same breath, the rarity of these creatures is part of what makes an encounter so special. It’s no secret that the cage and diving equipment makes it safer to enjoy a sought-out encounter with a shark but not everyone has the means to enjoy this opportunity. Also, experienced guides know how to safely draw in the sharks with chumming. These factors all combine to make your dream encounter a reality – despite being an experience that most people will not have in their lifetime. 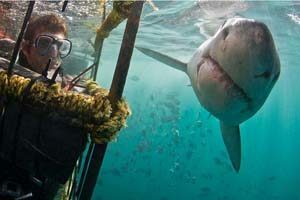 Add shark cage diving to your bucket list and allow yourself to have an encounter that could change your life. Make your booking today.